A contiguous T2 hyperintense track of Gliosis along the topographic distribution of pyramidal tract. WaD is seen along the ipsilateral descending white matter tracts traversing through internal capsule, midbrain, pons, medulla. An associated primary lesion may be cortical or subcortical is often found, may be an infarction, haemorrhage, neoplasm, demyelination, trauma; even reported in patients with movement disorder. 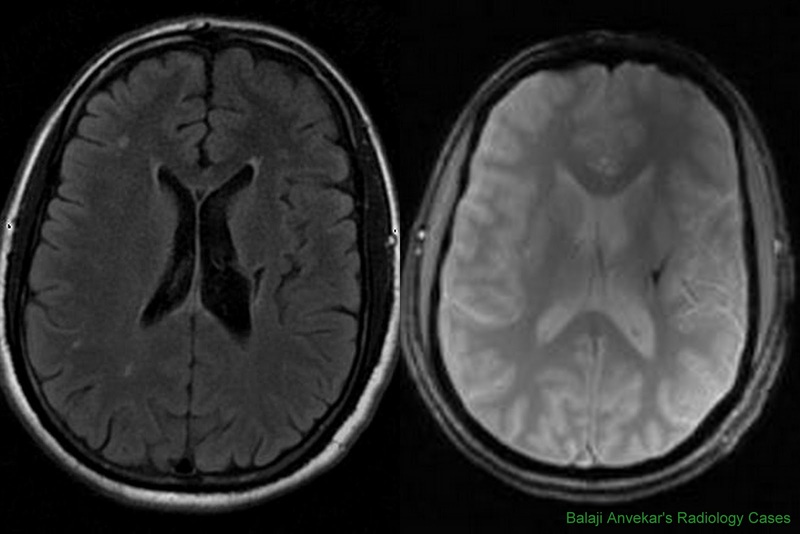 MRI diffusion T2 and Flair are must to pick up the finding, seen as a contiguous T2 hyperintense track of Gliosis, an associated asymmetry of brain stem due to atrophy in chronic stages. Being a chronic and degenerative process restricted diffusion on dw images and contrast enhancement on post contrast study not expected. CT is completely non sensitive. WaD is usually unilateral, always asymmetrical if it is bilateral. If bilateral and symmetrical think of ALS which is a neurodegenerative / motor neurone disease characterised by bilateral symmetrical contiguous T2 hyperintensity along CST extending from corona radiata down to brain stem and cord. MRI Axial Flair Brain shows a focal csf signal intensity Gliotic cavity with hemosiderin staining on T2*GRE in left corona radiata is a chronic resolved hematoma is a primary lesion with an associated distal wallerian degeneration seen as contiguous T2 hyperintensity in the region of posterior limb of ipsilateral internal capsule, mid brain , pons and medulla.